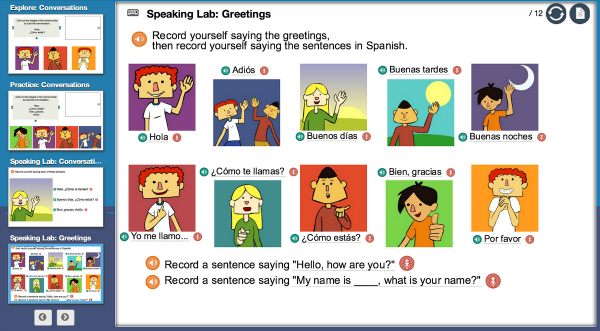 Middlebury Interactive Languages has offered us a semester long Spanish course for review. Knowing how much Levi loves learning languages, I chose the grade 3-5 program for him. He has really been enjoying this course! 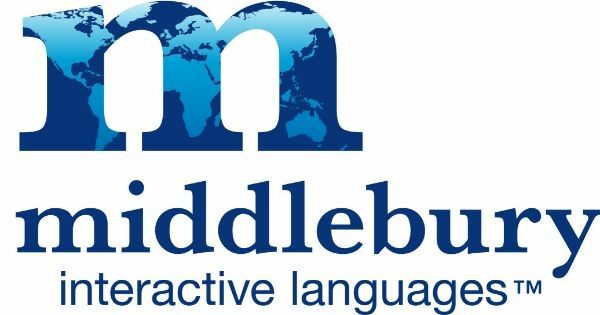 Though I had not heard of Middlebury College (in central Vermont), they have apparently been providing language learning immersion courses for some time, but mostly in residential programs. The Middlebury Interactive Languages program is a joint venture between the college and K12, which provides online curriculum for public schools and home educators. You can view a variety of promotional videos at their online language course website. Although composed of several features, lessons do not take too long.... maybe 15 minutes or so. A lesson had several parts/ screens so you could take longer to go though an individual lesson, but Levi is not that sort of kid -- he completed each part in one sitting. We aimed to work through 2 or 3 lessons per week; let me tell you -- this part of school was one of Levi's favorites! This course is a semester long and costs $119. There is also a second semester for this grade range as well. Technology needs: You will need a wi-fi connection whenever your student logs onto the course. None of the components are offline or downloadable. You'll also need up to date Flash Player. I was having difficulty with the program because my virus protection software was preventing pop up plug-ins; I ended up disabling the Norton plug-in for Chrome and it now works fine. I spent a few minutes in technical support with Middlebury Interactive about this, and they were so kind and patient to help walk through my issue. I love pleasant customer service! How this worked: Levi absolutely loved this program. Being able to be so independent with an online course was a big confidence boost for him. He loved grabbing headphones and recording his responses; his confidence in speaking his answers into the microphone while others were around definitely improved through the review period. The only writing component of the course I noted was typing at this point; there were not off-line PDF worksheets to practice handwriting in Spanish. Levi is getting an opportunity to read and hear Spanish spoken, with native speakers. He can do it independently, which really helps me. I do love that he is getting an introduction to computer-based learning and classrooms. I do not think this type of learning is going to go out of style anytime soon. While hearing an native speaker is great, there were a couple lessons (I'm specifically remembering when he had to record his phone number) when he could have used a slower model. To him, the entire sentences sounded like one LONG word! This is an immersion-type program. Once or twice Levi had to ask me, "How do I say..." because he didn't realize that the sentence prompts he'd been using in the lessons were the prompts he was to use for his recorded speaking quizzes. For the first two weeks, this was a limbo land for me -- I didn't realize that I would need to listen to these to make sure Levi's comprehension of the vocabulary was appropriate. I have a background in Spanish, so this isn't an issue for me (at least with beginning Spanish), but it would have been had we tried one of Middlebury Interactive Languages other language courses: French, German or Chinese. For an additional charge, there is an option to have a teacher for the course (I'm assuming he/she will do the listening and grading), so that would be a good feature for a language that is new to mom and student. The rest of the gradebook, however, is great. Multiple choice and matching questions are automatically graded, so I feel comfortable that his comprehension of listening and reading is coming along nicely. In all, we give this program double thumbs up from both Levi and me. It is such a fun program for Levi to work through that I'm sure he'll want to complete it on his own. I think my favorite part of this course for my 3rd grader is that he is gaining some confidence in learning a foreign language. (How many of us were hesitant to speak our high school foreign languages outside of class?) The course is laying down listening patterns which will help him be a more fluent speaker and is tuning his ear to help him understand the language at a conversational level. Middlebury offers courses for students as young as kindergarten up through high school. There is even a specific course to help students take the AP Spanish and Culture exam. To hear how it worked for other families and other languages, you can click below. Read more reviews of different languages and different grade levels at Schoolhouse Reviews.